Focused on the art of crafting complete, balanced meals that deliver sustained energy and nourishment, this book features 100 compelling and delicious recipes that just happen to be vegan. These 100 recipes for wholesome and nourishing vegan food from blogger, nutritionist, and Food52 author Gena Hamshaw help you make delicious vegan meals that deliver balanced and sustained energy. Every recipe contains the key macronutrients of healthy fats, complex carbohydrates, and proteins, which together make for a complete meal--things like Smoky Red Lentil Stew with Chard, and Falafel Bowls with Freekah and Cauliflower. Photographs accompany each recipe, showing how Gena's simple techniques and fresh ingredients yield delicious meals. Additional tips and tricks for taking food on the go, and for cooking ahead on the weekend for quick weekday lunches and dinners, round out the collection. GENA HAMSHAW is a certified nutritionist, recipe developer, cookbook author, and food writer. Her recipes and articles have been featured in the Huffington Post, Whole Living, O magazine, VegNews, Thrive magazine, Well and Good, Mind Body Green, Glamour, and the Chalkboard, among other publications. She is also a nutrition student, working toward a master's in nutrition and education and her RDN (Registered Dietary Nutritionist) at Teacher's College, Columbia University. She has written two cookbooks, Food52 Vegan and Choosing Raw, and is the author of the blog The Full Helping. "If you're looking for recipes to up your wellness game, this book has them. Power Plates is filled with healthful ingredients, balanced one-dish melas, compelling photos, and everything I want to eat right this minute." 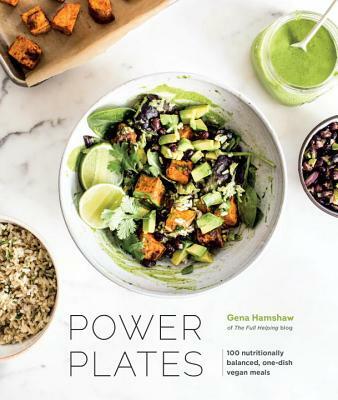 “Gena has a talent for making you consider plant-based food in a different way, and Power Plates delivers just that, with great dinner ideas, colorful salads, and wholesome breakfast alternatives. I can’t wait to try the sweet potato falafels, cashew queso, and so many of her other great ideas." "This vegan cookbook—with seasonal meal-plan charts that incorporate leftovers and ideas for batch cooking and freezing—is a useful guide for home cooks, vegan or not."